Access to Online Resources DOWN! July 11th, 2013 by madgett | Comments Off on Access to Online Resources DOWN! Yikes! All access to Online Resources seems to be down this morning. This is both on and off campus. We believe it to be an EZproxy problem and are working on it. Posted in access, Databases, E-Resources & Access News, eResources Blog, EZproxy, Off-Campus Access | Comments Off on Access to Online Resources DOWN! 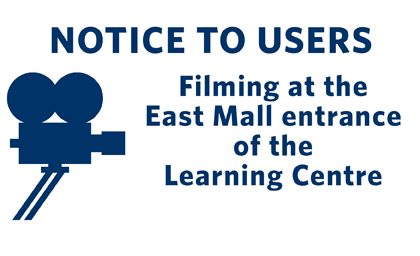 On Saturday, March 31, the Irving K. Barber Learning Centre (IKBLC) East Mall entrance will have limited access from 10 a.m. to 5 p.m. due to a film shoot. The film crew is scheduled to be on-site from 6 a.m. to 8 p.m. on Saturday. The main entrance will be decorated as a hospital entrance, and will include the presence of two ambulances. About 50 actors, extras and film crew will be on-site for filming. Visitors should be advised that heavy machinery, equipment and vehicles may be near the main entrance and the surrounding area. During the filming, which runs from 10 a.m. to 5 p.m., visitors can use the Learning Centre’s side entrances or the west entrance. Film shoots are scheduled to last about three to five minutes in length, during which time the East Mall entrance (facing the Student Union Building) will be inaccessible. Patrons with usability issues may use this entrance throughout the day, except during film takes. Bike racks at the front of the building will be affected as well. All other entrances to the building will remain accessible throughout the day. The Learning Centre, including the Library book stacks and Chapman Learning Commons, will maintain regular Saturday hours.